Winger Callum Hudson-Odoi deserves a place in the Chelsea starting XI, says former striker Jimmy Floyd Hasselbaink. Hudson-Odoi, 18, has won his first two England caps in the past week, but has never started a Premier League game. "It might be that he lifts the team in a different way and gives them a different dimension," said Hasselbaink. "Chelsea should bring more youngsters through. I would say Hudson-Odoi deserves a chance." 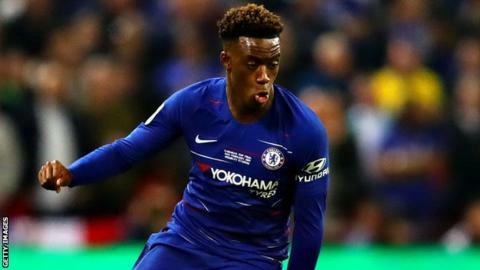 Hudson-Odoi, who came through the youth ranks at Stamford Bridge, made his first-team debut as a 17-year-old in January 2018, one of four appearances as a substitute last season. He has played 19 games in all competitions this term, all of which have been off the bench. Hasselbaink said: "Even if we are the number one, we all need sometimes to feel that there is another player or a younger player who can take our spot. Hudson-Odoi, who came close to joining Bayern Munich in January, became the youngest player to play a competitive game for England when he made his debut as a substitute in the 5-0 Euro 2020 qualifying win over the Czech Republic on Friday. He played the full 90 minutes of the 5-1 victory over Montenegro on Monday. Chelsea are sixth in the Premier League in Maurizio Sarri's first season as manager. Hasselbaink, who scored 88 goals in four seasons for Chelsea from 2000 to 2004, said he has sympathy for the Italian.